Friends are pleased to introduce board member Gavin Ferguson, the author of this article about the state of fisheries in the river. Gavin is an avid fisherman and is passionate about protecting the Metolius and native fish. Look for Gavin on the river any day of the year. Fish spawning numbers were good this year. Fall Bull Trout numbers were slightly down this year from last year but still healthy spawning numbers. 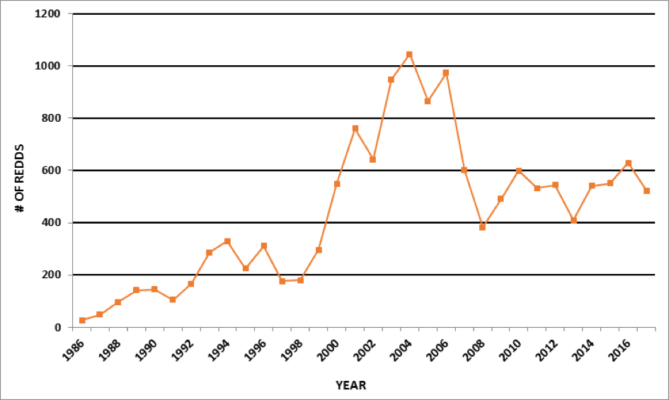 The Redband trout numbers last winter were the second highest to date. 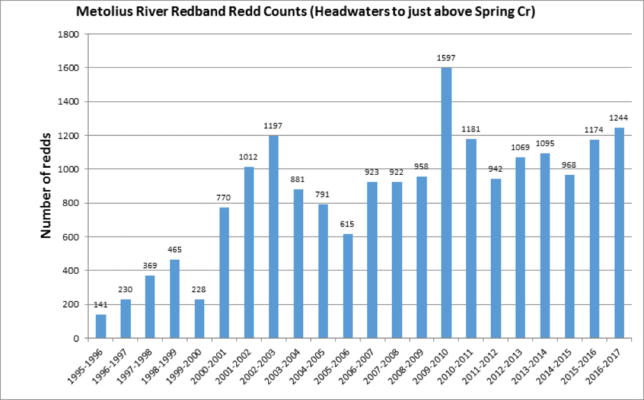 In December the REDD counting will begin for this year’s Redband spawning numbers. The Kokanee seemed to work their way up the river a little later this year than the past few years but were present in good numbers. A few personal observations: The Macro invertebrates seemed to hatch less sporadic this year than the past two years. The hatches were a little later than normal but strong hatches once they were on. Lake creek had more Kokanee spawning in it this year than I have ever seen in the 3 years of living on its banks. I see this as a real positive sign as Suttle Lake is where the Sockeye Salmon would be trying to get to if the dams weren’t preventing them from getting there to spawn. Most of the Kokanee spawn in the upper reaches of the Metolius where the Chinook Salmon would have been the kings of the river claiming those spawning grounds. Here’s some data compiled by local agencies tasked with monitoring the Metolius fisheries.